Looking back on everything, it totally makes sense. I started with an interest in fashion, then right after college, I got my first job at a multi-brand showroom. I didn't even know that showrooms, buying and selling through this third party, existed. I just found out about that job through a friend. From there I started to do lookbooks for the designers in the showroom because for some reason I felt like their lookbook could be better. So I would just do it for free, for fun, and then I started a little side business producing lookbooks. From there I wanted to get into buying, so I worked for Nasty Gal when they were starting in 2011 so that was after they moved from San Francisco to Los Angeles. For Lisa Says Gah, I’m doing sales, producing lookbooks, and buying; so every past job has kind of surfaced with this one. Were you able to apply your degree in advertising to your job at the showroom? Advertising was the most creative major at my school, it was as close as I could get to fashion. I learned how to pitch ideas and create a story. But still, at my first job I was so green. I had no idea how anything worked. That job opened my eyes to, "Okay, there are designers that make the product, they have seasons, they have the showroom where they sell the product to all of these different buyers who buy for their customers.” While being a showroom assistant, I shadowed and watched everything that was going on. I was pretty much steaming all day, so I just listened in to get an idea of how it all worked. Did you learn any skills as a sales rep or a buyer that helped you with Lisa Says Gah? For sure. As a sales rep, you're the voice of the brand, and responsible for its success in all of these different stores. As a buyer, you're doing the same thing but for a business. You're responsible for making the right choices, making sure that your customers are going to like what they see, and that it sells. Having that instinct of knowing what's going to work takes time, you can adjust as you see, but you also have to have an eye for it, too. As a sales rep, were you involved in that process? I had worked within the showroom for about four years and over time I became more confident in knowing what the buyers wanted to see, so I became more involved. We would look at a collection and edit down things that we didn't think would sell or that there were too many of. For instance, “You have six jumpsuits, let's narrow it down to two so that there’s a better chance of selling through,” because sometimes more options confuse buyers. Then we would explain that to a designer because they have a different vision. It’s about combing through things to help both parties meet. How did you come up with the idea for LSG? After I had left Nasty Gal, I moved to San Francisco and didn't know what I was going to do. I had done fast fashion, and I had worked for different designers, so I felt like I had a really good experience with both. My idea was to start a shop that was focusing on sustainability, slow fashion, and highlighting female designers who were doing something cool within the contemporary market. So the initial idea was to say, "no" to fast fashion say "gah" to these designers. What made you want to support independent female designers? Was there a gap or a need that you were trying to fill? There was, yeah. 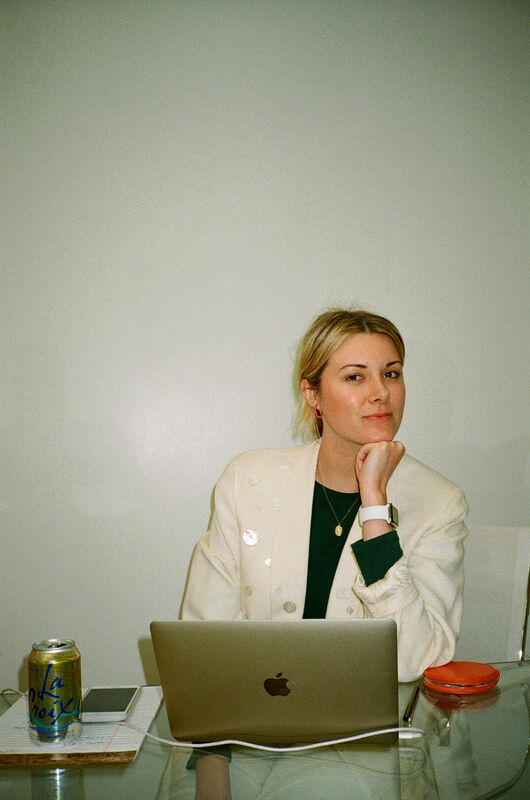 I was really into Maryam Nassir Zadeh five or six years ago, right when her line came out and I thought, "Yes, this is what needs to be happening." At Nasty Gal I was doing research and traveling for new brands and I was inspired by that, as well. Going to Australian Fashion Week and meeting with these new designers, I felt like there was a lot of exciting things happening, but they were getting lost. Or that a lot of the independent brands felt like they fit an older market and I thought that it could still be young and on the pulse of what's new, at an affordable price point. People are really into that market right now and it's great to see more stores opening up, but at the time it felt fresh and new. It needed a platform, and I wanted to build that. Once you decide to sell an item from a designer, what is that process like? So the whole process, when you think about it, is so much work for one item. We typically go to market week in New York, which is usually six months before shipments arrive. We go through the collections, take photos of everything we're interested in, and then we come back and put everything together. After that, we place our buys, prep the website for the product pages, and make sure we have copy. By the time it gets here, we unpack it, take measurements, and shoot it. If it's a new brand, we’ll do an interview to introduce the brand to the customers. And then orders get placed, it gets shipped, and hopefully doesn't come back! What are some of the ways that you've taken LSG from the site to real life? Obviously, you have a showroom here in SF, but how do you keep it as an experience and not only online? We did an event in New York in July 2018, it was so much fun. It was a panel and party at The Standard Hotel in the East Village. We got together some of our New York based designers, a couple of writers, and a YouTube blogger. It was a panel of about six women that were not all necessarily in fashion, but had been interested in it. It was packed and just such a beautiful conversation around sustainability in fashion. Then we had a pop-up for the weekend and I loved being IRL with everyone. We had an Australian come in and she was like, “It's so gah, I can't believe it." So the brand comes out in person as well, which is really special. I hope we can do more of it. LSG, it's part inspiration, part shopping, part blog. How do those mediums work together? I think that they compliment each other well. It’s about giving the brands more of a voice and a story so it's more than just a shopping site. We feel like we're driving inspiration and people come to us for discovery. So we want to make sure there's constantly something new and interesting they can engage with either on the blog or new arrivals. We don't have a ton of product so we want to make sure that the conversations keep going. What do you see for the future at LSG? So much. We just launched wholesale, which is exciting. I love working with other shops and brands, and it's opened up this whole new relationship with brands or stores that I've admired. It's great to kind of break down the wall of competition like, of course, we should work together! We both are into the same things, but we have different customers. And getting LSG, our in-house brand, to brick-and-mortar is really exciting and the first step is to do that is through wholesale. Also, doing more in-person events and just growing our team. What key traits do you look for in a potential employee or intern? Confidence. Someone that's really comfortable with themselves is going to take more initiative and be okay talking with me if there's an issue. And enthusiasm; they love the brand, they’re passionate about it and they're eager to learn more. The rest of you can just learn.